8 percent of the population at large, this number is quite concerning and disproportionately high. Three friends in Kansas City, MO – U.S. veterans themselves – decided to do something about it. Chris Stout, Bryan Meyer and Brandonn Mixon joined together to form the Veterans Community Project (VCP). The nonprofit is dedicated to ending veteran homelessness by building a specialized community of tiny homes. VCP addresses the underlying causes of veteran homelessness with onsite services and provides transitional housing to help end cyclical veteran homelessness affecting our military heroes. 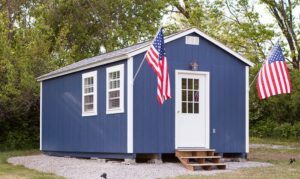 To bring this vision to life, VCP turned to Atlas Roofing Corporation for their building expertise in creating the nation’s first tiny home village for U.S. veterans. Because VCP operates solely through private donations and partnerships, they needed building product experts to help facilitate the construction of the tiny homes. Atlas was able to facilitate a forward-thinking insulation and roofing approach to the tiny homes in a way that would ensure the long-term cost-efficiency of the homes in the village. There were several factors at play for the transitional tiny home construction project. Cost: As a young nonprofit with no federal funding or grant money, VCP required building products that would attain lower energy costs, so they can utilize those savings on their programming needs. Sustainability: The tiny homes needed to be built with long-term sustainability in mind, including a sophisticated building envelope that would keep energy costs low. Regulations: Despite the rising enthusiasm for tiny homes, there were no specific building codes in Kansas City that had been developed for this type of construction. The building team would need to be nimble and adept at working with local regulatory authorities. Replication: With visions of expansion across the U.S., the VCP founders needed a partner who could help develop the tiny homes in an easily replicable way. Atlas Roofing Corporation was able to support the VCP construction and organizational goals by donating their expertise and products. To equip VCP with a complete building envelope solution tailored to their needs, Atlas Roofing Corporation donated materials from four business divisions—Roof & Wall Insulation, Shingles & Underlayments, Expanded Polystyrene (EPS) Insulation and WebTechnology. The Atlas team provided EnergyShield® continuous insulation for the tiny home walls, ACFoam® CrossVent continuous insulation with WebTech facer technology to provide insulation and ventilation for the roof, Atlas® Pinnacle® Pristine Shingles with Scotchgard Protector on the roof, and ThermalStar® X-Grade® EPS for below grade and under slab insulation. Together, these products create a protective, energy-efficient continuous insulation package that will keep energy costs low for the VCP Veterans Village well into the future. Just as importantly, these products work together to maintain a comfortable living environment for years to come. Each unique and innovative Atlas product promotes energy efficiency and conservation. EnergyShield combines high R-value, durable foil facers, and water resistive qualities in a high performance rigid wall insulation. EnergyShield offered VCP a better insulated wall than batt cavity could while meeting the same code requirements. 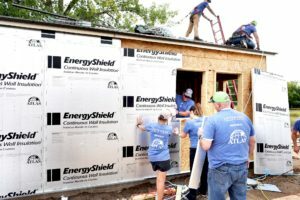 With Atlas EnergyShield, VCP will attain long-term energy efficiencies, incorporating an integrated weather and air barrier with a R-value of 6.5 and eliminating the possibility of thermal bridging. ACFoam CrossVent combines the benefits of a nailable roof substrate, above deck ventilation, and thermally efficient polyiso insulation with Webtech facer technology in an easy one-step installation. This installation-friendly design helped save valuable time during construction of the tiny home village, and it will support VCP’s expansion goals both locally in Kansas City and across the country. Rigid polyiso is one of the most cost-effective and energy efficient insulation products, while the Webtech facer is water repellent as well as being mold and mildew resistant. In order to secure a high-performance roof, the Atlas Pinnacle Pristine Shingle was utilized on all tiny homes. The shingles feature a Scotchgard™ Protector that prevents the ugly black streaks caused by blue-green algae. In addition, it provides a stunning color that will last a lifetime. The Pinnacle Pristine shingle also provides 130 mph wind resistance, which will help protect these tiny homes for years to come. For the roof underlayments, Atlas provided the Gorilla Guard® 30 and WeatherMaster® Ice & Water 100. The Gorilla Guard 30 is a lighter, stronger and smoother underlayment that lays flatter than traditional felt underlayment. The WeatherMaster Ice & Water provides a secondary waterproofing barrier which is needed to prevent ice dams and damage caused by wind-blown rain. ThermalStar X-Grade insulates the foundation walls and slabs for the Veterans Village. While providing insulation in walls and roofs is important, below grade insulation is equally as important to make sure there is not a thermal bridge between a building’s heated interior and the relatively cooler earth surrounding the building. According to the EPS Industry Alliance, the lack of insulation below grade accounts for up to 25 percent of a building’s total energy loss. ThermalStar X-Grade has a stable, long term R-value that will retain the same thermal properties over the life of the structure. ThermalStar X-Grade helps manage moisture below grade, reducing the potential of condensation, and also has an integrated termiticide to deter termites. Atlas was able to help VCP complete the first phase of its Veterans Village development in compliance with all local code requirements. In addition, the superior thermal performance of the building envelope will help VCP save money in the long run with increased energy efficiency, while also keeping residents more comfortable. Atlas worked hand-in-hand with AG3 Architects, a local architecture and interior design firm that additionally donated their time and resources to VCP. Because of their successful design and build collaboration, along with Atlas’s product performance, AG3 will be specifying Atlas products for the upcoming VCP community center build. With support from Atlas, AG3 and other partners, VCP has been able to open up its Veterans Village and help local veterans on the journey to permanent housing. The village currently has 13 tiny homes completed with full occupancy, and they laid the infrastructure for an entire village – including sewer, water and electric lines. Since launching in early 2018, VCP already has a handful of successful transition stories. Together with Atlas, VCP plans to expand its Kansas City community to 49 homes and hopes to build a tiny house community in every major U.S. city, including St. Louis and Nashville which are currently in various stages of development.